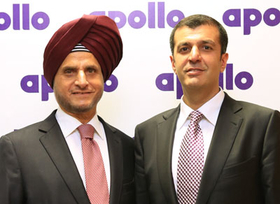 Apollo Tyres Ltd. executives Onkar Kanwar (left), chairman, and Neeraj Kanwar, vice chairman and managing director. FINDLAY, Ohio—The second time around proved to be the charm for Apollo Tyres Ltd. The Gurgaon, India-based company has struck a deal with Cooper Tire & Rubber Co. to purchase the Findlay-headquartered tire manufacturer for an estimated $2.5 billion. Once completed, the merger will vault the combined business up in the rankings with the top tire manufacturers in the world. A Cooper spokeswoman said the acquisition is expected to be completed in this year's second half. The merged company will climb to seventh in the global tire manufacturing rankings, the two tire makers said. Cooper currently is ranked the 11th-largest tire producer, while Gurgaon, India-based Apollo sits at No. 16. The firms had combined sales of about $6.6 billion in 2012, with Cooper accounting for $4.2 billion. Under terms of the agreement, unanimously approved by the boards of directors of both companies, Cooper stockholders will receive $35 per share in cash. That represents a 40-percent premium to Cooper's 30-day volume-weighted average price, according to the companies. The deal is subject to the approval of Cooper's shareholders along with the Securities and Exchange Commission and other regulatory bodies. Once the deal is closed, Cooper's stock would no longer be traded on the New York Stock Exchange. Cooper has eight plants in five countries; Apollo, India's largest tire manufacturer, operates four tire factories in three countries. No changes are planned at the 12 factories or with the management teams, brands and work forces of the two tire makers. Apollo will honor the present contracts at unionized factories as well as maintain pay and benefit packages for non-union workers, the Cooper spokeswoman said. She said the merger of the two firms is an excellent fit for both companies. "If you look at Apollo and us, there's no overlap. They were attracted to us because we are successful." Roy Armes, chairman, CEO and president of Findlay-based Cooper, said the deal is "a compelling transaction that is in the best interest of Cooper's stockholders and offers attractive benefits to our customers and employees." Together, he said, the organizations have virtually no geographic overlap and offer plenty of opportunities for growth. In an interview with Tire Business, a sister publication of Rubber & Plastics News, Armes said Apollo approached Cooper last year with an offer to purchase the tire maker. Cooper's board of directors determined it "wasn't in our best interest, so we walked away from it. "When they came back this time (with a higher offer of $35 per share), the board viewed this as a compelling value." He said it was a great deal for Cooper's shareholders, "who have endured years of our share price being undervalued." Armes said the premium of 40 percent was one of the highest of any major deal in the past decade. With the financial institutions backing the deal, he said it gave Cooper's board the confidence that Apollo could conclude the acquisition. It also is a good deal for Cooper dealers, according to Armes, because they will have access to a broader selection of brands and, eventually, tire offerings in the farm and off-the-road sectors. While no changes are planned within Cooper's management, Armes did not say whether he'd stay on board after the purchase is completed, but noted he is committed to ensuring a smooth transition. Anthony J. Deem, equity research associate-automotive for KeyBanc Capital Markets Inc., said he believes the long-rumored sale finally was made because Cooper's "management team was frustrated by the lack of appreciation to their shares after posting very strong earnings as of late, which may have fueled this decision to merge with Apollo." He doesn't think other potential buyers are likely to make a premium offer for Cooper because "competitors might benefit from the deal, as a well financed and very well managed manufacturer is now in the hands of a smaller manufacturer with significant leverage that is being managed out of India." The acquisition is a giant step up for Apollo. The company gains entry into North America along with the opportunity "to serve customers across a host of geographies in both developed and fast-growing emerging markets around the world," Apollo Chairman Onkar S. Kanwar said. He said Cooper has an extensive distribution network and manufacturing infrastructure, "and a particularly robust presence in North America and China." The combined company "will be uniquely positioned to address large, established markets, such as the United States and the European Union, as well as the fast-growing markets of India, China, Africa and Latin America where there is significant potential for further growth. Our combined portfolio of brands and products will be the most comprehensive in the industry." Neeraj Kanwar, who serves as vice chairman and managing director of Apollo, said Apollo and Cooper "have built strong reputations on the strength of their people, and the transaction will maintain the networks and work forces in each organization's respective regions, while creating new opportunities in others." Armes said he believes the companies can realize $80 million to $120 million in annual savings based on efficiencies and the lack of overlapping market presence. With Cooper soon falling under Indian management, Goodyear is the only U.S.-headquartered producer of consumer and commercial tires not owned by a foreign-based company. Bruce Davis, Tire Business staff, contributed to this report.